This name derives from the Hebrew “Yehônâthân > Yônâthân”, meaning “gift of God, Yahweh has given”. 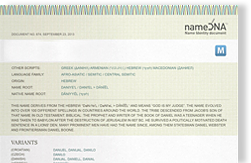 Jonathan is a heroic figure in 1 Samuel in the Hebrew Bible. He was the son of King Saul and close friend of King David. The relationship between David and Jonathan is one of the most notable biblical relationships. Jonathan first appears in the biblical narrative as the victor of Geba, a Philistine stronghold (1 Samuel 13), while in the following chapter he carries out a lone attack on another Philistine garrison, demonstrating his prowess and courage as a warrior. The name day is celebrated: France: 1 March, United States: 26 April, Sweden: 22 December, Germany: 29 December and Finland: 26 January.